It can be difficult to make a lifelike copy of a butterfly because of how delicate the wings and body structure are. This tutorial teaches the best way to bring realistic detail to a faux butterfly. The key is the thinness of the paper you choose for the wings. If you can't find thin paper, an option is parchment paper such as one would use for cooking. 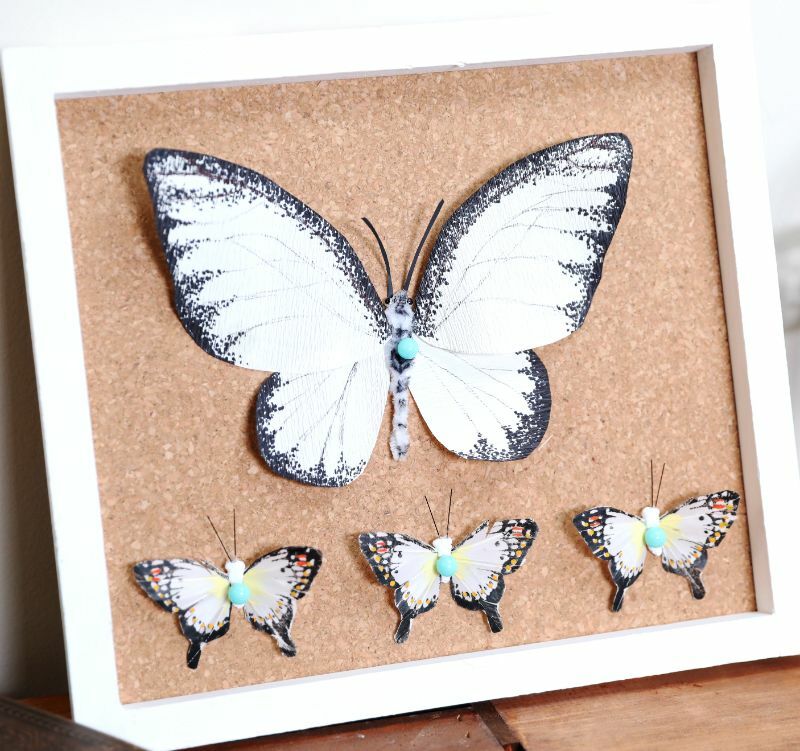 Express your inner entomologist by displaying these butterflies on a cork board or in a shadowbox. For the most realistic effect, go online or to a library to check out nature photographs; pattern the butterflies after existing species. 1. Measure or estimate and cut a 6-inch-wide strip of paper from the roll. Place the strip horizontally on the work surface. Cut off two pieces 5 inches wide and and two pieces 4 inches wide from the strip. 2. Draw a wing shape on one larger piece. The wing should look like a large water droplet. Place the paper on top of the other large piece and cut out the shape. 3. Draw a wing shape on one smaller piece. Place the paper on top of the other small piece and cut out the shape. 4. Angle a large wing on the protective paper so the pointed tip is up. Starting at the tip and going down the two sides, fill the sides with marker dots, going no farther than 1/4 inch in from the edge. 5. Draw wing veins using the pen. Repeat steps 4 and 5 with the other large wing. 6. Angle a small wing on the protective paper so the pointed tip is up. 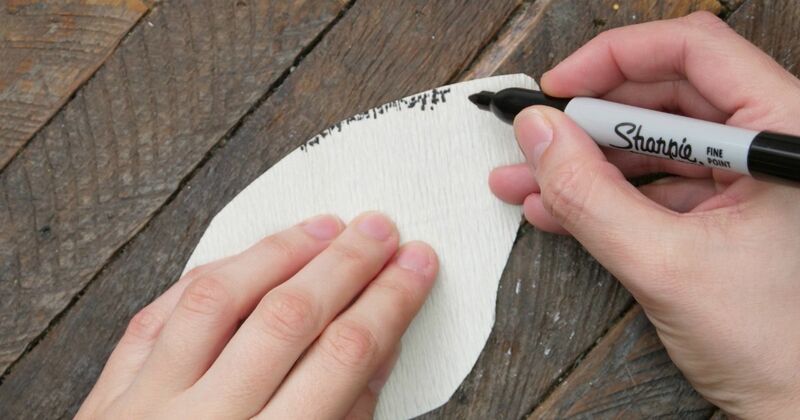 Fill the rounded bottom with marker dots, going no farther than 1/4 inch in from the edge. 7. Draw wing veins using the pen. Repeat steps 6 and 7 with the other small wing. 8. Arrange the large wings so the tips point slightly to the left and right of north. Arrange the small wings below so the tips meet where the two larger wings touch. 9. Bend the pipe cleaner in half. Twist up from the bend 1 inch. Tie three knots in the remainder of the pipe cleaner and fold over so it looks like a butterfly's thicker body. 10. Glue two beads on the sides of the pipe cleaner where you want the eyes to be. Apply marker to the beads so the eyes have large black pupils with a bit of bead showing around the edges. 11. Apply marker to the pipe cleaner body in random locations to add depth. 12. Cut out two antennae with a line linking them from the black card stock. Glue the antennae to the bottom front of the head so you can't see the connecting line when the butterfly is pinned. 13. Glue the wings to the body in the position from step 8, separating the wings so they adhere to the sides of the body. 14. Pin the butterfly to the cork board.